I have a long history of spectacular tomato tart failures. There was the one that enchanted me on TV a decade ago, with a parmesan crust, bacon, fine breadcrumbs and roasted garlic, that — several hours of work later — ended up tasting metallic and clashy against the acidic tomatoes. There was the tomato tarte tatin flop from a fancy French chef, for which I have only myself to blame. And two summers ago, there was an heirloom tomato galette, with colors like a rainbow, that fell apart before we ate it. The problem more often than not is a basic one: tomatoes are very wet and tart crusts need to stay fairly dry. But this has never stopped me from trying again, and I’m glad, because it led me to this. Sort of. This too spun from a disaster, a gnocchi failure last week that involved these same fixings. But we were so in love with the combination — lightly charred and slumped cherry tomatoes, sauteed zucchini, crunchy sweet corn, scallions and parmesan that I’ve become convinced it should be applied to everything this month from pasta to farro to omelets. Inevitably, it made it inside a galette and guys, it’s been way too long since we made a galette isn’t it, a whole three years since this zucchini-ricotta riff and six (sheesh, this blog is making me feel old) since the butternut and caramelized onion one made its debut. Unacceptable. Let’s fix this. This one works better than the tomato tarts of the past for a few reasons. Because it’s a mixture of vegetables, and not exclusively tomatoes, there wasn’t as much moisture fighting its way out. 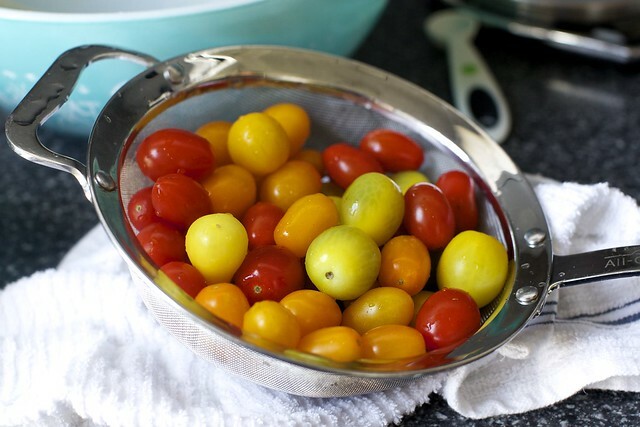 Cherry tomatoes are smaller and less wet than big heirlooms, plus they were cooked a little first, letting out some of their juiciness (and also concentrating it in the pan, deliciously). Finally, maybe I’m just relaxing after all these years of being overly obsessive, but when I saw a teensy, inconsequential bit of juices come out as I sliced it, I just shrugged. Tomatoes are tomatoes, and suddenly I was sure we have better things to do this summer — beaches, barbecues, boats, I hope, and that’s just the Bs — than to fight it. Tomato tarts are one of my most favorite summer foods. Gorgeous galette, love the burst tomatoes! Those grape tomatoes look so yummy, I would just spoon them up and eat them right away! Major yum! I’ve been living off a variation of this filling all summer, but with garlic and basil. And if you get the chance, try it with feta instead of the parmesan. Oh my god. Heaven. Am I the only one that finds it’s the zucchini that has the higher mushing out factor? I actually made a tart yesterday of tomato and Jarlsberg and intentionally left the squash out as a precautionary measure. You have my admiration for the a singular focus of finding the just the right balance for a baked tomato pie. So perfect. I made the tomato and corn biscuit pie thing for a birthday party potluck a couple if weeks ago, and also added zucchini and basil. Summer staples and flavor perfection! I was looking for something for a picnic lunch after camping that doesn’t need to be cooked, chilled, or prepared at all, and this may just do the trick! Can’t wait to try it while sprawled out in Saratoga State Park. Oh! That looks nice and easy! I think i’ll just make the filling and eat it! :) Delish!! I have everything but the sweet corn. Easily remedied. It’s on the dinner menu for Meatless Monday, or should I add bacon?!?!? I’ve got your cookbook and love that delicious ideas just keep coming, TYTY! 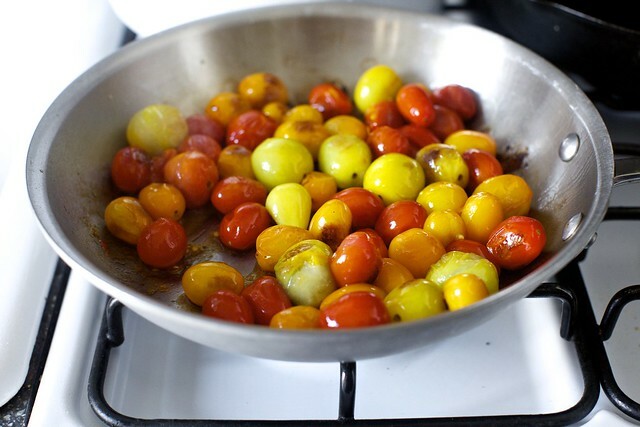 Forgot to say, the recipe is an answer to what to do with wildly producing and delicious cherry and grape tomatoes. I grew a variety called Sun Drop and it was early, prolific and so sweet. Looks terrific and oh, so summery! This looks and sounds delicious! Full of the flavours of summer! I am not generally a tomato person but this looks amazing. Any chance you’ll be hosting another cooking class in NYC? I am still kicking myself for not getting a spot at your last one. Oh my heavens. Hold your horses. That looks ridiculous in such a good way. Mmmmm…. Summer in a pie crust! Looks awesome. Deb, what do you think about substituting parmesan with goat cheese (I have some I need to use up)? This looks so amazing and I magically have everything to make it! Thanks! Great recipe for using up some of that summer produce. This is so timely. I adore your corn and tomato pie (and the tomato shortcake from the cookbook). This will solve the top crust step that forces me to roll yet another crust which is not my favorite chore. Plus, it gives me another use for the bounty of garden zucchini that is beginning to get out of hand. I have a favorite vegetarian concoction that heats kidney or cannellini beans with tomatoes, zucchini and sprinkling of oregano that’s served over a bed of rice. I imagine the beans could be added to this recipe, too. Already thinking of other fillings to pair with the yogurt pastry. Molly — yes on the squash mush factor — not good. 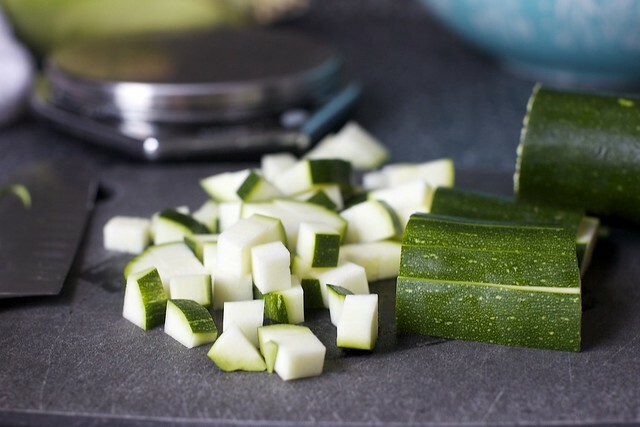 With other dishes, I usually just add zucchini at the end, so it’s warmed up but still firm. Curious to see how the textures play out here. I swear, I was already planning on making your tomato and corn pie for dinner tonight. Proof: pie crust is in the refrigerator. Game changer! Thank you! This is exactly the filling recipe I was thinking of making tonight, topped with a breaded chicken cutlet…but I didn’t have the recipe yet! My husband and I had a similar dish at a local restaurant recently and I wanted to recreate it. I’ll try the galette part later. :) You’re the BEST! I am in love with vegetable tarts of all kinds, and tomatoes, zucchini, and corn are all at the top of my favorite ingredients list. The only way this would check off every box on my favorites list would be to dollop some goat cheese on top, but it looks so pretty that I’ll have to try it your way first! Oh I love galette with fruits, one with veggies must be amazing as well! This looks DIVINE! Can’t wait to try it! Can you believe I haven’t had ANY corn this season??? Unreal. that is stunningly beautiful – can’t wait to try it.. Thank goodness you came up with this! Funny how food failures can lead to this kind of awesomeness! We love making galettes at our house too, so much easier than fiddling with a pie plate. This time of year ours are usually filled with peaches, but a savory prep like this sure sounds great. This looks delicious. I’m a savory tart addict. Wouldn’t cutting the tomatoes in half and then roasting in the oven get rid of even more moisture? Sarah B — Definitely. I just like what happens when they pop a little — get brown at the edges, slump a little (but don’t fall apart). Caitlin — I think goat cheese would be delicious here. sandra — Boo! It really was a one-time thing, as part of the SK Cookbook cooking class series (which I totally forgot to mention here, because I’m a jerk) they did a Sur La Table. But maybe? I mean, it could happen in some other format in the future, I’m sure. Oh, I’m in love with this! How gorgeous. This would make an amazing appetizer, or pair it with a salad and you have a completely beautiful dinner. I wonder, could you use sun-dried tomatoes in place of the cherry ones to cut down on moisture? This looks so amazing. I have extra pie dough in the fridge from some hand pies last week and I’ve been trying to find something new to make with it. I have tomatoes ready to be picked so this is definitely the winner! I can’t wait to make it. LOVE all the fresh and summery ingredients! Galettes are my idea of a no-fail meal, unless your pastry doesn’t have enough flavor or richness. This definitely looks perfect! I just bought heirloom tomatoes from the farmer’s market this weekend. They will be perfect for this! I’m new here to Smitten Kitchen. That looks absolutely amazing and delicious. Thank you for sharing this with such awesome photos! I’m going that make that this week!! Deb, you are the answer my CSA box has been looking for. Thank you! Ok was going to do sauted potatoes, zucchini and corn tonight for supper but this has changed my mind – I have everything but scallions but will sub in shallots. Lovely idea. So incredibly gorgeous, and couldn’t be more perfect for summer! Oh my God I cannot WAIT to try this! I’m scared but I’m going to do it. I love zucchini and corn together. I keep making zucchini corn fritters even though hot oil spltters and burns me, every. single. time. I make them. I don’t care, they are so worth it. I’m going to a neighborhood party on Thursday and bringing this! Thank you! Just this week I made this: http://www.saveur.com/article/Recipes/Tomato-Cheddar-Tart. The cheese mixture under the filling, and the fact that I used mostly cherry tomatoes, made for a not-at-all soggy crust. Now I will have to do it all over again with your filling, which has my mouth watering! 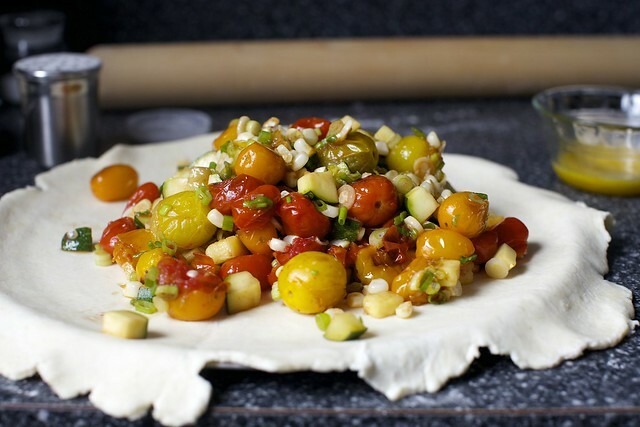 I’ve never seen a galette recipe that contains all the best ingredients of summer! I will have to go the the farmer’s market and make this over the weekend! Looks delicious! Could this be frozen after being assembled and then baked at a later date without sacrificing quality too much (I’d love to save one for midwinter when I am craving the flavors of summer)! Hi Deb. I made the zucchini and ricotta galette a while ago and struggled with the dough which is the same one here. When I baked the galette it was almost as if the butter melted and pooled out of the crust to collect on the parchment paper I was baking it on (this is the best I can think of to describe what happened). This made the texture of the crust a little strange. I am thinking my butter pieces were too big? Does this make any sense? Would using a food processor to make the dough be a bad idea? Because I am not very good with a pastry blender, or maybe I just need to have more patience, or work out more. How do you read my mind?! I was just thinking last weekend that I wanted to make a simple pie with tomatoes and zucchini, but I couldn’t find a suitable recipe anywhere! And as soon as I saw the title of your recipe, I thought, “But gee, Deb, aren’t you worried about the crust getting soggy?” And lo and behold, that’s one of the very first things you mention in your first paragraph. I love the look of this and will probably try it, but have you considered a kind of savory crumble with tomatoes? Then they could be as juicy as they want to be, and there’d be no crust on the bottom to get soggy. I keep thinking about just making up a recipe along these lines, but I debate whether I should put a thickener in the tomato portion, and what to use if I did. Flour? A bechemel? Cornstarch like in a fruit pie? Or would the shiny-ness be weird? Is this a recipe you’ve considered? Our garden has been producing tons of tomatoes and so far I’ve only made homemade pasta sauce. I think I’ll try this one as we’re getting tired of the same old tomato recipes! :) Looks delcious! Oh my word! That sounds heavenly!! This is in my oven as we speak!! Thanks for such an inspiring recipe. Crust scares me to death, but this was accessible. Love your creative recipes!! Hi Deb, this looks great. Also, I saw your cookbook in Costco today, sitting next to Thomas Keller’s Bouchon Bakery book. I’ve never noticed it there today, so it was pretty exciting. Congrats. Allison — Butter pieces were definitely too big. I know that’s annoying because you’re encouraged to make them stay in visible bits! But you’re basically looking for the biggest pieces to be no larger than tiny peas (i.e. petite pois) or fregola/Israeli couscous. The crust is totally worth trying again, I promise. Mary — I’d think so. I think the zucchini might be softer but it would otherwise taste good. Btw — We just reheated the leftovers from last Thursday and even days later, the crust is still firm at the bottom and never got soft. I hope I didn’t worry anyone too much about the little bit of tomatoes juices inside. Robo — I am concerned that it wouldn’t have enough liquid to bake in and even if it did, it would really need to bake for an hour in it to approximate doneness. But as I mentioned above, yes, the tomatoes have a tiny bit of juice released but it’s not enough to really be a problem. I love all the chunky, gorgeous, texture-filled, vibrant-colored veggies! It’s summer inside that galette, for sure! I just took mine out of the oven! But I made the crust gluten free and am so excited for dinner. I was planning on making your summer squash & potato torte this evening but dreading all the slicing…and then along came this recipe, just like magic. I only had 1 cup of tomatoes, so I added 3/4 cup of chopped (peeled) eggplant, and I swapped out the parm for some other cheese that I had on hand but can’t remember the name of. Otherwise, I followed the recipe exactly and it was lovely. Not runny at all, and a wonderful use of our garden veggies. Oh, and the crust is divine. Thanks for another great summer produce recipe! I just made this for my family and they loved it! Super easy to make and very flavorful. Thank you for such a great recipe! I plan on making it again. THIS dish looks so delicious. All that gorgeous summer produce wrapped in that buttery pie crust. I was just wondering the other day if I could use yogurt in a pie crust, and I see that you did. I’m going to have to try it! This looks like my farmers market purchases in a lovely crust. Yep Wednesday is my Farmers Market Day and I’m baking this for sure!!!! I’m just gaga over tomatoes and I’m from The Jerz where they are just yummy!!! Heirloom tomatoes are never wrong! I made a swiss chard and apple tart, sweet and savory tarts cover all the bases! I’ve done something similar with big tomatoes, laying the slices out on a pad of paper towels for a while first. The galette crust was of puff paste and they weren’t overly juicy. This time. I went ahead and made this tonight, and IT WAS AMAZING! I had to sprinkle some bacon on top to make it husband-friendly, and was absolutely blown away. Bacon totally not even needed. I did add a wee bit of butter to the tomatoes while they were cooking, and had a small panic attack as I tried to get creative with two different kinds of small tomatoes that insisted on not bursting at the same rate, but it all came out wonderfully once I just put it all in a colander to drain the juices. I also added a bit of lemon juice, additional salt and pepper, a dab of tomato paste and (god help me) some bacon drippings as well as lining the bottom of the crust with cheese. It was so rich and tasty, thank you for posting! I love that combo of ingredients, too! Except you should add a bacon and minced basil sprinkling on top. Then, it would be heaven. I was going to make a pizza this week, but I think I’ll make this instead. Yum. Oh. My. Gosh. I made this tonight, instead of the pasta dish I had planned with my tomatoes and zucchini. I’ve never eaten a better crust, let alone made one. I was quite pleased with myself, and with you, Deb! The husband and the kids all gave it a thumbs up too. I added goat cheese along with the parmesan because I had it. It was divine. Made this tonight for supper. I love your butternut squash galette so I knew this would be a winner. Total Perfection! Definitely making this the next time we have guests for dinner. I didn’t have the makings for a crust, but I had everything else on hand. I ended up putting the filling over polenta and it was perfect! Although my husband and I have enjoyed many of your tart/galette recipes, so I know the recipe as-is will be in our near future too. So funny, I had every single one of these ingredients and wondering what to do with them! I was too lazy to make dough, so I just put the veggies over some brown rice and topped with parm. It was really good, easy, and light! Galettes are always the way to go… In my opinion, the more rustic it is, the better. This looks so freakin’ amazing, Deb! This looks delicious! I will be trying it ASAP, I’m so glad it’s tomato season. I am big fan of cherry tomatoes and sweet corn and this burst tomato galette looks like is an excellent way to have both together. Thanks Deb, I will be trying this soon. I’ve always had the same problem with tomatoes based galettes, so thank you Deb for giving us this recipe! This is probably the most appealing savory tart I’ve ever seen and it totally screams summer to me…can’t wait to make it! I love your entire series (set?) of galettes, but this flavour combination might be the best one yet. I made your cookbook’s version of the butternut squash galette last fall to rave reviews, so I can’t wait to try this! just perfect for my summer meal!!! If the moisture in the vegetables is a problem, it might be worth roasting them first, which would evaporate some of the moisture besides boosting the flavor. It could be done in the 400 degree oven while you are making the pastry. I make something almost identical but just as a stovetop mix. Have served with rice before. I like to use the yellow zukes as well. I also add basil. This is so great! I’m tired of seeing zucchini muffins and breads. This is a much better use for them! The colors are just gorgeous -so inviting! I just made the crust in advance for tomorrow’s dinner. Believe it or not, in Germany a pastry blender does not exist, so I used my finger tips. While the butter was in very small bits (the flour mixture looks like wet-ish sand) when I added the liquid it was way too much. The dough looked like thick pancake batter. I ended up adding 6 more tablespoons of flour and it finally came together (though still very sticky) and now it is in the fridge. Do you think my butter was too warm? I’m hoping it will work out once the dough has had a day to cool. I double-checked my measurements and know everything was right, so I’m just curious what could be wrong. I’m totally afraid of what will happen in the oven! ollie — The butter may have gotten too warm. This is, however, a stickier-than-average dough, but it should not be like pancake batter. As you work the dough with your hands, it gets warmer, and the butter gets melt-ier, so touching it as little as possible and returning it to the fridge or freezer frequently for a few minutes to re-cool the butter can help. This looks beautiful. I’ve never made a galette, but you’ve inspired me to do so. I’m thinking of roasted tomatoes and eggplant and caramelized onion. Has anyone tried this with a bought roll out pie crust? Pastry: Done! (festooned with LOTS of cracked peppercorns) Nice timing for this recipe, my neighborhood tailgate is today so the entire filling will be fresh-from-the-field, and cow! I’m thinking eggplant will add nice texture and flavor, and basil. The Plan: Bake off early PM before the house heats up, serve at room temp, sprinkled with balsamic. I’m anticipating an Instagram moment. My neighbors are going out of town and I’m to “babysit” their garden and harvest it’s goods for myself this week…the bounty includes summer squash and tomatoes! I agree, this delicious combo will indeed be in everything from omelets to farro this week :) Thanks for sharing – perfect timing! I’ve made something very similar before, but I called it succotash pie (it had limas!). I can’t wait to try this with your galette dough. My mom uses to make a shredded zucchini casserole (with diced onions, garlic, shredded cheese and eggs) and salted the shredded zucchini in a colander for a few minutes, then pressed it a bit to express the excess moisture. It works very well and should work in this recipe, though I haven’t tried it myself. I love this idea of a savour galette. Perhaps it will be what’s for dinner tonight! Dinner tonight for sure! I love tomato anything, and especially tomato tarts and pies. Thanks for a GREAT recipe! I’ve been pondering a tomato tart, and am so glad to read all your tips! This looks mouth-watering. I’ll second roasting some of the tomatoes first. I usually put a layer of roasted tomatoes down on a baked tart shell then top with fresh (salted and drained) tomatoes. It really puts an end to soggy crusts. I also like to up the parm factor by reducing my flour to one cup and subing a half cup Parm. Honestly, so good I could just eat the crust plain. I will make this tonight for some friends. But I don’t have a handheld pastry blender. I usually make pie crusts in the mini food processor to mix the butter and flour. Could I do that and then add the other ingredients after? I am worried because my hand is very warm and it’s hard to work with buttery crusts. 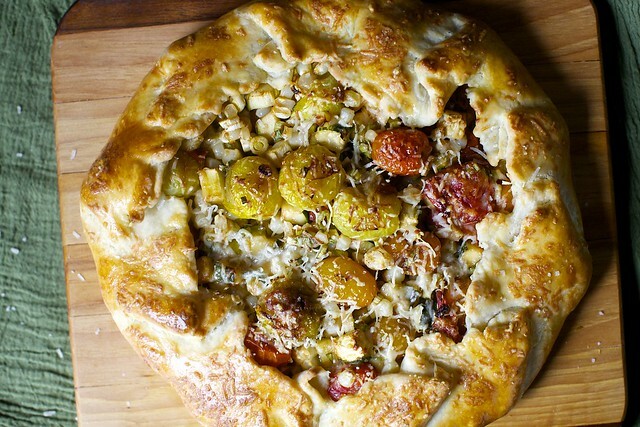 I have been staring down a pint of cherry tomatoes for about 3 days, and here you are in my email with this gorgeous galette. this is the perfect recipe! I love the corn/tomato/zucchini combination and can’t wait to try it. I just scored a whole bag of yellow cherry tomatoes from a coworker, but they’re a tad on the softer side, like they may be in danger of being too juicy. Do you envision that being a problem, Deb? Also, I was thinking of making a baked Brie to go with this and was wondering if you had any recipe suggestions! This looks wonderful, and I’m so excited to try it once my tomatoes in the garden finally ripen. 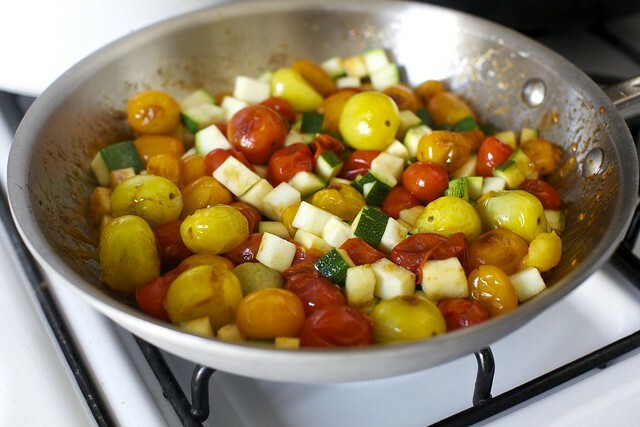 I am wondering what you think about salting the tomatoes and zucchini and putting them in a strainer for a bit before continuing with the recipe? Would this help with a possible excess liquid issue and do so without messing up the texture? I am a faithful reader but hardly ever comment, but I have to say something about this absolutely genius recipe and beautiful photos! (Not that those two things are anything new or unusual on your site.) I want to just eat that plate of vegetables. I have never made a galette, but you have me inspired to try. Finally, I can get all these lovely veggies at a local farm stand right now (50 cents for a zucchini, $1 for a pound of tomatoes, 4 ears of corn for $1, from a farmer in her 80s) and you have given us a number of ideas for what to do with them. Thank you! This looks yummy. I just made an apple galette and your pastry looks really good, is it a pastry that can be used for fruit as well? Also what is the difference between a galette and a crostata ? Alice — I think they’ll be fine. I really worry that I oversold the wetness of the galette as it’s not a huge issue. The cooking of the tomatoes (the “bursting”) really removes most of the excess wetness. Teresa — Yes, but I always think it’s best to mix the wet stuff in by hand. So, pulse the butter with the flour mixture then dump it into a bowl and stir in the rest. It keeps the butter from getting overly blended. Had six guests for dinner last night. This dish was the star. Perfect in every way. This was so darn good! I was hoping my husband wouldn’t eat much of it so there would be some left for lunch but he loved it and finished it all! The dough was sticky in some spots and dry in others so I had my doubts but it baked up very well. I can’t wait to make it again. Looking forward to trying this after many a mishap combining tomatoes and dough too. Tried something similar for a party this summer in a mini appetizer format. Failed me greatly. Plan to try this as a side dish in muffin tins. Will see if it works in that format. Thanks for the great recipe! These ingredients are fresh in Maine right now so this will be a great recipe to try. I’d like it as a main course with a yummy salad. I made this tonight and it was delicious! Very fresh flavors! I’m tempted to make another one with goat cheese after reading all of the comments. Only one change- I added fresh basil and parsley because my garden is overflowing with them and they go in everything I make right now! Just made this for dinner. Absolutely delicious. This was so helpful to use veggies from my CSA! It was remarkably easy, it looked much more complicated than it was. Made this for dinner tonight and it really was excellent! I’d almost recommend using salted butter for the crust (unless there’s some structurally related reason why? ), it was very crusty-delicious, however almost got a little boring. I forgot the scallions, which bothers me because I think they would have been great. Some carmelized onions would really push this over into the seriously delicious arena! Thanks for the recipe! Just like the rest of America, I made this beautiful galette tonight for my boyfriend and myself and it was PERFECT. I have a bunch of goat cheese I needed to use so I substituted it for the parmesan, and it turned out wonderfully! My bf, who hates all pie (chicken, apple, pecan), thought he wasn’t going to like it, but he LOVED it! Thanks for an amazing recipe that I will be making again very soon. Will do it for sure! Many thanks for idea! I often battle with soggy crusts in vegetable quiches so I’m very excited about trying this! While I was in London I went looking for a pie dish (Switzerland doesn’t know much about pies) and found a flyer advertising that you’ll be there in October! How can I find out where in Europe your book tour is taking you? Are you coming to Zurich? Sivani — Good catch! So, yes, we are plotting a UK trip in September and I hope to make an announcement of the dates and towns in the next week or two. It’s just the UK, probably in and around London (I don’t have a ton of say in these things, sadly). Funny enough, I emailed my UK publicist yesterday to remind her I wanted to get the announcement up soon and accidentally emailed a reader with just about the exact same name. Fortunately, she was friendly about it. I’m surprised I don’t do this more often. P.S. It would be so great to meet you! I’m attempting this with the Bon Appetit buttermilk pastry, instead of your suggested pastry (because I have nearly a gallon of buttermilk to use up–what was I thinking? Pancakes and buttermilk cake, dear friends, that is what I was thinking.) I’m excited to finally have an excuse to put sweet corn and tomatoes into the same delicious pan, and include pastry as well. Sweet corn and tomatoes really are just summer in a dish. Thanks, i gone use your recipe for that pastry, i want taste your pastry at first place! This rally was outstanding, loved the burst of summer vegetables with the light but substantial crust. I cant use parmesean or romano (my husband cant be in the same room as it) but instead i used queso fresco and it worked beautifully. Thanks for a wonderful summ meal! That galette looks roasty, toasty, and oh-so-nice. I love the little bits of scallions scattered about the filling. Can’t wait to try this one! Love this idea, and it looks beautfiul. Great idea for using zukes and tomatoes. 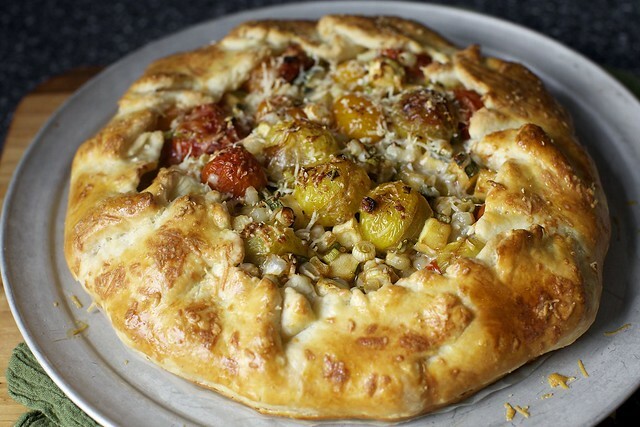 Definitely making this galette soon. Thanks! This is spectacular! Do you think I could talk your mother into making this for dinner? I could become a vegetarian! Made this last night and it was terrific! The only changes I made were that I used more zucchini than tomatoes (our CSA just gave us A LOT of zucchini) and I cheated and used a frozen pre-baked pie crust that I already had in the freezer. I was so excited to make this tart! I had everything in the fridge from my last CSA trip. However, even though I strained the liquid from the tomato mixture, the galette still seeped a lot of liquid in the oven. It has about 20 minute left to cook— I hope it will be okay! Any idea what I did wrong? I’ve never heard of this dish before but in a way it looks and sounds like everything I’ve ever wanted. mieke — No, I haven’t given up but when I’m in a rush (as I have been lately) it’s always the thing that gets shorted. I will add them now. If you ever need them and don’t see them on a post, just leave a comment gently reminding me and I’ll add them ASAP. Yay, another mouthwatering galette recipe! I’ve been using your pastry recipes for tarts both savory and sweet (I love your onion one) and I am psyched about this latest. I hope you never feel that you’re writing about too many galettes; they’re such a great excuse to play with the flavors and textures I’m most craving at any given moment. Thanks! Thanks, it turned out great! I did exactly as you instructed (but I read your response after I made it, so felt good that we were on the same page). By the way, there is a typo on the last sentence in the “assemble galette” instruction, “last pinches or parmesan”. I made this, and it was fantastic. The dough was easy to handle and sooo flaky. Then I got cocky and tried making the Peach Dumplings from the SK cookbook. The final three dumplings I managed to make tasted fantastic, but the dough was so difficult to get to clump together and roll out. I feel like I did the same amount of blending with the pastry blender on both, any other ideas? Hi Jen — Might the dough have just been warmed up by the time you were forming the last three? Warm dough is always the pie-enemy. Beautiful! Love how rustic this looks! Made this last night and OMG it was PERFECT! I had two heirloom tomatoes and about a cup of cherry tomatoes, so I did roast the heirlooms first. Beyond getting out some of the juice, I think the roasting added a nice flavor to the mix. The only other thing I did different was toss in a handful of herbs from my garden…basil and parsley, along with the scallions. Otherwise I followed your directions exactly, and I can’t believe the crust turned out so well! Thank you for helping me get over my fear of dough! I’m going to be galette-ing it up for the next week I can feel it! Hinted at wanting your cookbook for Christmas :) Great job!!! PS – anxiously awaiting U-Pick peach season up here in MA. Dying to make a peach galette! I made this last night and it is absolutely delicious. The crust, in particular, was flaky and perfect. I added grated parmesan to the crust and thought it was a nice addition. I made this the other day for lunch and it was perfection. Used all fresh ingredients from my organic vegetable garden outside. I have also never had luck with tomato tarts– many disaster stories to note. This though, was a fine surprise. The crust was to die for. I used the pastry blender last time, but tonight just mixed a batch of dough again and used my fingers. Deb, do you or the readers here have a preferred method of mixing the dough- that is using your fingers or the pastry blender? I am very new to crust making and curious of the differences. I’m thinking I may have blended it too much with my fingers tonight..I’ll see how it turns out later. Jacquelyn — Glad you enjoyed it. I prefer the pastry blender because it’s lo-fi and doesn’t warm the butter in the dough. But I know it’s less popular with others. I made this tonight, and it was the most delicious thing I have ever tasted. The crust alone, much less putting farm-fresh veggies inside! I made two of these for a brunch I hosted today thinking I would have some leftover. Nope, everyone loved it and the one piece that was left someone wanted to take home for their husband to enjoy. Luckily, I bought enough ingredients to make three, guess what we’re having for dinner tomorrow?!?! Love the combination of flavors. My non-meat eating friends were thrilled with it. It was the first recipe I’ve made from your site now I’m off to order your cookbook. Thanks for a delicious and easy recipe. 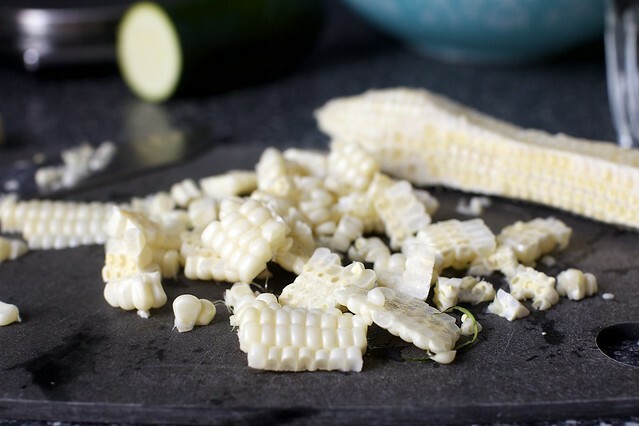 I got my CSA basket and found…tomatoes, zucchini and corn, so this recipe is just in time! I just made this last night and the dough was so wonderful!! Seriously, the best food that I’ve made and eaten in a long time. However (there’s always a however), cooking the tomatoes in my skillet made my kitchen very smoky. Even though we had the fan on, I was hacking away as I rolled the tomatoes around. Might have been because we added in too much red pepper flakes, but whatever the reason, I was not expecting that. But it was so worth it. So glad I had all the ingredients on hand for this. Made this for dinner last night and just might make it again tonight! Great recipe. This looks terrific and I bet would make good use of leftover corn- I always make extra. It seems versatile enough to work with all kinds of tomato and_____ combinations, as long as you keep the juice factor in mind. I’m looking forward to making a number of permutations, and I love the dough recipe; I have never added yogurt to dough, but I imagine the acid helps to make the crust tender. I know the dough can be made a day or two ahead, but can the entire galette be made a day ahead? If not, can the tomato/zucchini mixture be prepared the day before? Arlene — I would probably make the dough, keep it wrapped in the fridge, make the filling, keep it in a container, a bake it before it’s needed. It does reheat well, once fully baked. But I’m not sure I’d assemble it and keep it raw until baking it. I made this last night for my boyfriend and his vegetarian daughter, and it made me look like a genius. It was perfection. Deb, I’ve been following you for several months now and I must thank you for many a wonderful meal. I felt compelled to comment for the first time however after making this scrumptious galette last night. Previously I’ve been intimidated by the thought of making a crust but your gorgeous pictures convinced me it might be worthwhile. And to my surprise- it was so easy! 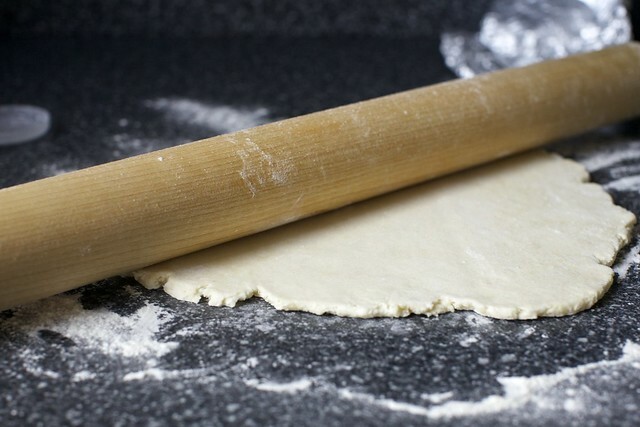 Thank you for opening me up to a whole new world of things wrapped in dough. I cant wait to make this again and to continue following your helpful and delicious recipes. Used the filling for a pizza topping with a harissa oil and fresh mozzarella on top. Delicious! Elizabeth — I’ve never had harissa oil before but it sounds AMAZING. Wow! I made your galette crust and filled it with sliced peache slighly sweetened and thickened with flour. A pinch of cinnamon for good measure. ASTOUNDING RESULTS! Best pastry I ever made. Thank you so much!!!!! I added about a teaspoon of dried oregano to the veggies just before they were done sautéing. Have a basil plant that won’t quit so tossed those fresh leaves on before serving. It ended up being an ah-mazing rustic pizza-like dinner. Has anyone “cheated” and used store bought dough? I know its a crime but I like shortcuts. That was absolutley delicious. I ws worried that there were no herbs or seasonings other than salt pepper and a pnch of crusched red pepper but it really let the vegetables shine. It was amazing. Sure herbs would be great but wow even without. I will make this again and again. Will also use the crust and fill with hmm all sorts of yumminess. Thank you! I made this yesterday… with delicious but unexpected results. I only had time to refrigerate the crust for about an hour. Mistake! It was completely mushy and unusable. I’m going to make it into cheese sticks today so it doesn’t go to waste. I threw the filling into an oven-safe pan on the stove with some eggs, tossed in just a few basil leaves, baked it a bit and called it a frittata. Delicious! Do you think this dough would freeze well? I often bring pre-made doughs along when we vacation in rental houses, so we can have pies etc. with local produce, and I don’t have to do quite so much work on the spot. Thanks. I finally made this tonight after fantasizing about doing so since you posted it and it’s just as amazing as I hoped it would be! (Here it is: http://instagram.com/p/c2U9suD_Tj/) I doubled the recipe but didn’t change anything. The only issue I had was with the crust—I refrigerated it for about an hour, rolled it out to what I thought was the right thinness, and ended up baking it for… 36 minutes? But even though it was golden brown on top, it was a little soggy; it didn’t seem completely cooked. Although both my parents said they liked it that way. (Although my dad makes himself what he calls “pale flabby” pancakes so when it comes to undercooking I don’t exactly trust his judgement!) Should I have refrigerated or cooked it longer? Rolled it out more thinly? But that was my only problem! Like a commenter above, I wondered whether, because it didn’t have any herbs, it would be flavorful enough, but oh my gosh. I’m not sure how to describe just how NOT not flavorful it is! Blissfully good. Making this right now for dinner and it looks fantastic! Just love the galettes I have made from this site in the past, so I’m sure it will be epic. Did sub baby eggplant (so cute) for the zucchini since it didn’t look great at the farmers market on Thursday. Great! Had it tonight–crust flaky, buttery, wonderful. Filling so, so savory. We would see the crust hosting many other ingredient combinations this summer and beyond. I’m not sure whether you thought of this and passed it over, but I just made this and since I already had my flour shaker out for rolling out the dough, I sprinkled about two teaspoons of flour over the veggie mixture before I put it on the dough – figured it works for fruit pies. Worked perfectly. Not a single drip. This looks awesome! Can’t wait to make it soon! For the crust can you use Greek yogurt? This turned out really well – my husband loved it! I ended up making some bizarro substitutions in the crust (cider vinegar for lemon juice, greek yogurt + splash of milk for plain yogurt) but it worked! Other subs: canned corn for fresh, decreased the cherry tomatoes and added some diced orange and yellow tomatoes (as dry as I could get them) when you add the corn during filling prep. The grocery didn’t have the assorted cherry tomatoes and I really wanted that pop of color :) We also strained off a lot of the liquid before putting the filling on the dough. Thanks for a great recipe!! I FINALLY got to make this last night after savoring your post all week! Having ingredients on hand is not the only thing required. Time is precious, I want to enjoy cooking, not be aggravated by the rush. It was so worth it. I was able to grill an herb-marinated pork tenderloin and make a blueberry crisp for dessert to accompany the star of the show, Smitten Kitchen’s Burst Tomato Galette. My daughter and husband always remark that they’ve just eaten at the only 5-star restaurant in mid-Michigan :) I made it true to the recipe and it was utterly fabulous. Thanks, Deb. Also love trying new things from my Christmas gift, your cookbook! You are an inspiration. I made this tonight, and it was delicious! I added some browned sweet Italian sausage because, well, why wouldn’t you? I think I’m finally getting the hang of pastry dough after many years of trying. I think one of my problems was that my idea of “pea-sized” seems to be different than others–thanks for the “tiny” description! WOW! Followed this nearly to the T and it was spectacular. Didn’t have quite enough cherry tomatoes from the garden, so used an early girl too–drained the excess juice and it was fine. So nice to use what’s growing in my garden. You could use a store-bought dough…but the dough itself was part of the awesomeness. Sooooo good. Thank you. Would be good with basil; or feta and olives. Love your site and recommend it to others all the time. I just made this last night, had a friend over and it was great! The only thing I would change is next time I would add more spices, I did not add the red flakes. I refrigerated the crust for a couple of hours and it turned out great, very flaky. I would definitely make this again! this looks great. I took a spin on this recipe this weekend and made your tomato corn pie with biscuit crust in a galette style over the weekend. That worked out really well. The only think i might do different in the future is mix the corn, cheese and mayo mixture together before putting them in the crust instead of layering them like in the two crust pie. Hi Deb. I have to agree with Ollie (post #85) my dough was so wet that it was almost the consistency of lumpy cake batter. I have made pie crust (as well as scones, biscuts) many times before so I am familiar and comfortable with the process of working cold butter into flour until it is in little pea size bits, so I don’t think anything went wrong there. I wish I had trusted my instincts and did what Ollie had done and add more flour when the dough turned out too wet because I had lots of problems working with it as a result. I’m puzzled that other posters didn’t seem to have this issue. All that being said, the flavor of the finshed product was very nice, so I would give this another try, but definately add more flour if I felt it was needed. made this last night – it was a big hit at dinner and a wonderful use of august tomatoes! the dough was a little tricky to work with – it didn’t want to be moved from the counter to the baking sheet. next time i’ll try using more flour. Made this for a birthday dinner — with produce entirely from my garden that needed using up — and it was spectacular. Dough was manageable — and I used 0% Greek yogurt, with no ill effects. Delicious — and I think I’ve finally gotten over my ‘I hate cooked tomatoes’ issue. Thanks for yet another awesome recipe! I made this last night and it was great. Do you think some crushed fresh rosemary in the dough would work? Becky — Definitely. I love rosemary in savory doughs. Gail — I’m sorry you had trouble. This dough is definitely on the damp/scary side. The time I made it when it’s seemed almost like lumpy cake batter (for me) I realized I hadn’t made the butter bits tiny enough. Still, when I chilled it and rolled it out on a very well floured counter, it looked like this in the end. Were you able to use the dough in the end? DELICIOUS. Crust was absolutely amazing. The bottom was a little soggy, so next time I’d drain the filling in a colander. I bought all the veggies at the farmer’s market this afternoon, and made it for dinner – summer on a plate! My husband had 3 servings. ps – my dough was wet, but not as wet as others described. I chilled it in the fridge for about 16 hours, floured both sides before rolling, and found it VERY easy to work with. I was very happy that it wasn’t crumbly – the curse of pie dough. Sally — The book one was big big big. Well, not huge, but I was aiming to make it more substantial and dinner-y. It’s really the same crust with minor tweaks, and you could definitely use it here, then even double the filling. Made this tonight; it was amazing! Oh my, I’m definitely saving this recipe to make again. I didn’t have sour cream, so made a regular all-butter pie crust (yesterday), and subbed some small yellow squash for the zucchini. Wish I could post a pic here! Finally got around to making this tonight using squash, tomatoes and mushrooms. Love the tang of the sour cream in the crust! Awesome way to highlight fresh, summer produce! I made this delicious little tart last night with a colorful batch of our cherry tomatoes and one of our Zephyr squash, plus I strayed and added a whole head of garlic. It was easy, fabulous and a real “keeper” of a recipe. Thank you, Deb!! As someone often grossed out by Zucchini, I was wary… but it’s hard to go wrong with something wrapped in pie crust, so we made it almost exactly as you suggested on Saturday with veggies from our community garden. Holy CRAP this is tasty!!! We used fat free greek yogurt instead of sour cream and it was still the best crust I’ve had in a while. Zuch’s and tomatoes were perfect. Corn gives a great crunch. Cheese is made of cheese, so it is always a winner. 10 stars. yum yum yum. Made the galette last night. It was delicious! When I put the dough in the fridge, it was extremely sticky and I was hoping that the fridge would work some magic over the 4 hours it was in there. Unfortunately though it was still just as sticky when I began to roll it out. I had to add a lot of flour to the dough just to be able to get it to not stick too much to the bench (which next time I will remember to do at the beginning before it goes in the fridge). I put some caramelized onions on top of the corn, tomato mix as another commenter suggested and it really added a great flavor to the dish. My dough was pretty wet but I was still successful without using any flour. I rolled it out by hand (not too thin) onto a big piece of parchment paper, added the filling, and then pushed the paper up and over to form the crust. There was still a fair amount of sticky dough left on the parchment but it just cooked into little brown flaky bits and all was right again. I may try this again tomorrow with a fruit filling! Hi Deb. Thanks for your response (post 184). I did use the dough in the end, but I wasn’t able to roll it out properly. I was determined not to throw it out though since I already had the filling all ready to go, so I did what I could. The end result was that the galette was thicker in some spots than it should have been, but it all tasted great, so I would give this recipe another go. BTW, I am not a zucchini fan, so I varied the filling a bit. I did keep the tomatoes, but I replaced the zuchini with teeny fairtale eggplants and swapped out the corn for carmelized onion instead. I had leftovers of the filling so I added it to some pasta the next night – delish! I’ve made this twice and its great! The dough is really forgiving and easy to work with. Yum! This was amazing. I had to stop myself from eating the veggies without the crust, but I am glad I did. The dough was really easy to roll out, either because of this new french rolling pin (my mom gives me a lot of cooking supplies) or, as I suspect, it was easy due to all the practice. Why is it men seem to need meat with all their dishes? I did not add bacon or anything and if he doesn’t like it, he can just eat cereal. I made this tonight and it was delish! Only problem I seemed to have was the bottom not being anywhere near as crunchy as the top. I even pre salted the zucchini and squash (i did a mixture of the two) in attempt to get them to release their juices ahead of time to avoid the moisture issues. I think when the tomatoes started to cook down even further they just released all their juices on to the bottom of the crust. Next time I may just forego the cooking of the tomatoes before hand and just let them do their thing in the galette or maybe just use this filling in a tart thats been pre-baked. BTW I used greek yogurt instead of just normal yogurt and it worked out great. One small tub is just the perfect amount! I made it with farro – it was delicious! I totally recommend! My first galette ever! Left the corn out and put in some onions from my garden. My 3-year old helped rub the butter into the flour and roll out the crust. He also insisted that we use cheddar instead of parmesan. An excellent choice! Made this this weekend – AMAZING. Since my daughter is celiac, I used Cup4Cup flour and it worked beautifully. Great way to use up the over abundance of cherry tomatoes in the garden. May need to make it again this weekend! I made this last weekend for dinner with friends…it was a huge hit! So much so that I’ve made it twice again already for my husband and I to enjoy. I can’t wait to try new variations! I made the galette on a week night and we liked it so much that I made it Sunday for friends. It was so hot that day that we didn’t want to turn on the oven. My husband used the gas BBQ to bake it. It was great. I made this recipe this evening and it was amazing. The lemon in the crust is a wonderful touch. I did add the red pepper and went a little further and added a bit of smoked paprika which added a great earthy element to balance all that acidity. Oh, and I added bacon. I bake a fair amount, but had never made something like this. I would happily do it again. The only thing I would change in the future is taking the filling through a quick strainer. 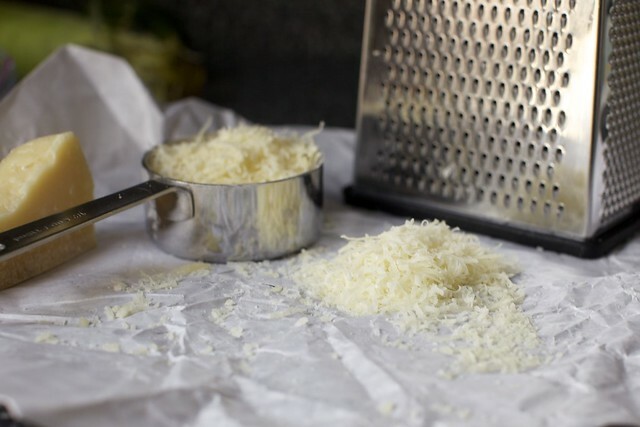 To save time I grated frozen butter using the larger sized holes on a box grater. Refreeze while you weigh your dry ingredients and then mix in quickly. I also substituted plain goat cheese for the Parmesan. Fantastic warm and UNBELIEVABLE at room temperature the next day – IF you have leftovers. Just made it for some friends yesterday and was delicious! I used heirloom cherry tomatoes and cooked them too long, so they kind of disappeared into a sauce, but it still tasted fantastic. Thank you for the recipe! This was simply delicious. Okay I cheated and did not make the pastry and store bought it….sorry just not enough time, but, never the less, it was delightful and I enjoyed every morsel! My Mum spreads a little dijon and goat cheese on her pastry before adding the tomatoes. I’ve done it with her recipe so tonight I’m going to try it with your recipe. I hope it works, I’ll let you know. Great recipe! Exchanged the red pepper flake for herbs de provence. Will definitely make again and probably use fresh herbs. Think I slightly overcooked the tomatoes and still delicious. Just purchased the cookbook after years of following the blog and have to say that between Jacob Henry and your introduction I was in a fit – crying and laughing all at once. Please don’t stop! I made this tonight for my dinner club (the theme was tomatoes, of course!) and it melted in your mouth. The tomatoes, zucchini and corn were delicious and the pastry was perfect (I added a little more flour than you listed above…so that it wasn’t too sticky to roll out). I made two: one was the exact recipe above and one was with Jarlsberg cheese and prosciutto (minus the corn)…both were great! This was so good, I made it twice in one week. The first time, I made the dough. It was really wet, but I think I just didn’t flour the counter enough. The second time I used a store-bought crust I found in the freezer, and it still tasted great! I made this the other day with cherry tomatoes from my Dad’s garden and zucchini from the supermarket. I didn’t have corn but I did have fennel, and I had to sub some baby leeks for scallions. i also used creme fraiche bevausei had no yogurt. The dough was scary wet and sticky, and I thought for sure it would disintegrate in the oven. Noooo, it was perfect! I ate half the galette myself. Definitely a keeper! I made this last night to take to the Hollywood Bowl. It tasted wonderful but I think I tried to cut and transport it too soon. Next time–and there will be a next time–I think I’ll make it far enough in advance to allow it to cool completely before cutting. I made this for dinner this evening and it was good but not as good as I thought it would be. The filling was a wonderful savory sweet when it was prepared but after baking in the pastry became acidic and overwhelmed the sweet corn and charred tomato flavor. I’m wondering if it was because I used plain Greek yogurt in the pastry (I was out of sour cream and regular yogurt). Any thoughts? I’ll definitely make the filling again but maybe use a different pastry that’s baked first in a ramekin, then filled and topped with the Parmesan to make a crust to cut down on the baking time. Kind of a pot pie variation. made this for dinner tonite – absolutely delicious! the filling was as wonderful as i thought it would be and the crust just kept me going back for more. thank you! @EastCoastWest I never seem to have an extra hour after work to wait for dough to chill, and so I went the store bought dough route. I was afraid it would be too small with the sides folded over, so I prepared the filling according to the recipe than spooned it in to a store bought pie crust in a pie pan. It was delicious! Made this last night and added a little garlic and herbs de Provence to the veggies mix. I found heirloom cherry tomatoes at the farmers market last week. Used a mix of squash and zucchini from the garden. Very good! Crust turned out wonderful. I made it early in the day let it sit in the frig for several hours. Good to see posts that store bought dough works too. Thanks for another wonderful recipe. Yummy! Made this tonight and it was very, very good. The crust was buttery and flaky. The filling was super tasty and I’ll be making it again for other dishes. Thanks for the terrific recipe Deb! I have been wanting to conquer my fear of pastry and started with this recipe. I was delighted and amazed that it turned out just like you said it would! My cherry tomatoes didn’t make popping sounds and so I overcooked them but the filling was still very tasty. I found the dough quite sticky and thought I might have used too much flour to get it to roll out. Is there a rule of thumb for how much flour to use? Overall, another recipe that’s a keeper and one I’ll try to get better at making. It was very tasty and we ate it with flank steak and salad. I made it and it was delicious. Except I did not like all the tomato skins. Other than that it was perfect. I don’t often use non-canned corn so maybe this is a dumb question. Should I boil the corn cob before I use it? Or will cooking the corn in the galette in the oven be sufficient? Quisty — It cooks in the galette, no need to preboil. It stays more crisp than canned corn. Made this again last night with a few changes: used cottage cheese in lieu of yogurt because that’s all I had, and a dash of vinegar instead of lemon juice. I made the filling with mushrooms and onions and a few chopped up olives. Delish! Lovely, but a bit bland. I followed the recipe to the letter (and I do appreciate the weights noted in the recipe, not simply volumes, thank you). I then amended with 1 T herbes de Provence to the tomato mix and wish I had chopped a health dose of fresh rosemary into the crust. The herbes helped a lot. As I am not a pastry maker generally, must say this turned out quite nicely using a silpat vs parchment. And it was pretty on the plate with a lamb chop. Wow, I made this last night for dinner and it was truly delightful. The crust is kind of tangy, so it really compliments the corn and tomatoes. I’m just sad that summer is nearly over because I would have been making this for months otherwise. Thanks for a fabulous recipe!! Forget the galette. I have two words for you: steak salad. Start with the cooled filling from this recipe. Cook a steak as you like it and slice thinly. Mix it all with arugula, a nice lettuce, some fresh herbs, a simple vinaigrette, and crumbled feta. Fabulous! I cooked this last night and it was great! Deb, your recipes are fool-proof. If I make it again, however, I will try to start earlier and get the dough out of the way. I didn’t leave myself enough time to let it cool and it was difficult to work with. But it still turned out great! My fiance made the kale salad a few posts up and they were delicious together. 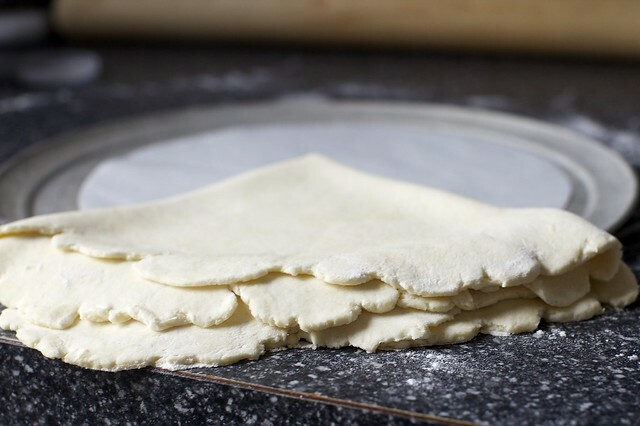 Sounds tasty, but here’s a way to make a galette even easier – roll out dough on floured teflon sheet. Add the ingredients, fold up sides, finish as you recommend and bake on the teflon sheet placed in a cookie sheet. It’s also easier to clean whatever might bubble out. Made this a few nights ago and added a bit of fresh rosemary from the garden. It was wonderful. This also reheats perfectly in the oven. Thanks for the recipe. I made this last night and my husband and I were both impressed by how awesome it looked and how delicious it tasted! This recipe is a keeper. I added some fresh basil and parsley since I had some. I think it would be fun to make mini versions to serve at a dinner party, and not too much extra work. This is one of my most successful and favorite recipes of yours that I have tried so far, it turned out perfectly! The pastry was so flaky and buttery, the filling so flavorful, we loved it! And the leftovers reheated the next day were just as yummy. I’m a new fan of galettes! We just went vegetable picking upstate, and I had this recipe in mind so I picked the items I needed…can’t wait to make this galette! It looks so good. I sometimes struggle with making doughs/bread but this looks simple enough. Thanks! This came out amazing! the colors were so pretty. An addition I made, was crumbling caprino cheese on top right before oven. (mostly because I had all ingredients at home except the parmesan). It was so tasty! I gave this a go today (even though I was nervous to make my own pastry!) and it so did not disappoint. It looked so pretty, especially with the different coloured toms and tasted great. I also found the dough a little wet and added a handful of flour so I could work it into a ball. How did you get your tomatoes to stay together? I am in total awe… Mine were pretty much decimated immediately, and the filling looked like gazpacho! Anyway, I drained it and the tart was absolutely delish! Hi from Knysna South Africa. I saw your website today and Wow! Great stuff. Your tomato galette was scrumptious. I first roasted the tomatoes slowly in the oven with a tiny bit of olive oil and garlic. No runny juices and it was amazing. I grow tiny tomatoes and have a glut so roast quite a few at a time. Thanks for sharing your recipes and enthusiasm! I made this for dinner two nights ago, and it was such an instant winner that I had to comment. For one thing, after cooking from this website for four years, it was the first PERFECT dough I have ever gotten. While I was making it, something just clicked– it was craggy and barely held together, and sure enough after baking, it was the best damn tart I’ve ever made. I swapped lime juice for lemon, used NF Greek yogurt, and cut a frozen stick of butter into small dice, then blended it with my hands. I also diced a Yukon Gold potato and threw it in when the tomatoes were almost done sautéing– when the tart was done, the potatoes were al dente, but I found the texture to be a nice contrast. Finished with fresh basil. Thanks, Deb, for your winning recipes! Another fantastic galette! I didn’t have parm or scallions, but instead lined my crust with a thin layer of mayo, Dijon, thyme and cheddar. It held up so well I even took a hefty slice for lunch on a kayak trip. Thanks again. I just made this for dinner–so delicious! I needed a recipe that would work after I failed spectacularly in the kitchen last night. I know I can always count on you! Wowza!! I made this! It was light, yummy and my man ate most of it! Dough was easy to make it did seem a little wet so I just added more flour. I am not a big cooked cherry tomato person but this was great. Also super huge plus…. I had all the ingredients in my house!!What!! Ps…..If you are out of eggs is there another way to make a wash? My galette was a bit dull compared to your super lush glossy one. Also it was only a wee juicy but that was a plus not a minus in this case!! Wowza, this was good. Made it for a nice dinner with my sister tonight. Everyone was beyond impressed. Heck, even I was impressed with myself! The crust was perfection and made me feel like an accomplished pastry chef! I couldn’t believe how nice it was to work with and easy to fold around into a beautiful shape just like your photo. Now I’m looking forward to autumn to make the butternut and caramelized onion galette. Sour cream is usually thicker than regular yogurt. Can regular yogurt be used here? Or should it be Greek yogurt? Oops! Sorry – I didn’t word my question well. I actually don’t want to use sour cream, since I rarely have it in stock. All I have on hand right now is regular (whole milk) yogurt. Just wondering if that will work, or if I need to go to the store to get Greek yogurt instead. Thank you for responding so quickly, and sorry to pester you with a follow-up question. Angela — Yes, it should be just fine. I’m forever in your debt for this recipe. I make it with a regular all-butter crust, and it is one of my favorite foods in the world! Perfection. I made this Sunday with a mix of veggies we grew ourselves and others from the farmer’s market and just wanted to thank you. This was one of the most delicious things I’d eaten in a long time and it also suitably impressed my guests. Thank you. I have been wanting to make this since you published it and for one reason or another, it never happened. However, with the end of corn season at the green market looming I finally did it. Per a comment (and my luck to have rosemary growing in my window), I added fresh rosemary to the dough. The dough worked beautifully – no lemons so I used some vinegar. I keep pecorino and not parm on hand, so used pecorino. Wonderful end of summer treat. And the dough is a keeper! Thanks for continuously posting recipes that are not only delicious, but also accessible. First time I made a galette, can’t wait to try another! I lack a pastry cutter, but a trick I’ve picked up for making biscuits is to use a box grater to shred frozen butter – since it’s quicker for me to do it, I usually don’t soften the butter to much from manipulating it with my hands. Seemed to work for the crust! Thanks for the recipe! This was amazing! Although we caused quite a neighborhood stir when we made it last night. I wasn’t entirely careful in spooning the juices out (I also used regular tomatoes as I didn’t have enough cherry tomatoes). Soon enough I smelled smoke coming out of the oven. I quickly opened the windows and doors and turned off the oven. The brisk fall air whisked the smoke right out of my kitchen. But 5 mins later the fire trucks and cops were here. Boy were my kids (3.5 and 1.5) excited. And the neighbor’s kids. And the kids of the neighbors 3 houses down. And the lovely 13yo who lives across from me was in babysitter heaven. Gotta say though that the galette was incredible!! My picky 3.5yp who doesn’t like corn and zucchini loved his “pizza”!! Success again Deb!! Thank you. Just wanted to say that I’ve made this on multiple occasions to great success. It’s a real crowd pleaser, easy enough not to screw up, and so pretty to top! We enjoyed this so much (with 1/2 cherry, 1/2 chopped green tomatoes, cause that’s what we had) that we made a huge batch of the filling a few days later and tossed it with pasta (there might have been bacon and smoked paprika involed… I deny nothing). Just this week we made a double batch of the crust and used a bit over half to make a squash/kale/caramelized onion galette, and the remainder of the crust was turned into a apple/pear galette, with just a few dried cranberries sprinkled on the crus to soak up any excess juices. Thanks for this amazing, versatile recipe. We have really enjoyed it! Just chiming in to say that this is one of my favorite recipes from SK — I’ve filled it in with various stuff, including mushrooms when I’ve had them — whatever I have on hand that marries well. Changed up the cheeses and added herbs too! We eat it for breakfast with eggs and parsley, serve it up for lunch with a fresh salad, have it as a side for dinner with red meat — it’s so, so good. I’ve also brought it to friends as a gift, or a panacea for busy or tough times — it’s eye-pleasing and reheats quickly and well. Thanks, Deb, for this treat! We made this tonight, inspired by your Facebook post! It was absolutely delicious! Thanks for the great recipe! This recipe has been on my list since I first saw it – in fact, I have made numerous variations of the burst tomato filling for other purposes, like as a side dish or on pasta. But tonight I decided to actually make the galette, and it was delicious — even though I forgot to move my dough circle to the cookie sheet before I started piling on the filling! I used a pizza-peel-thingy and a large pancake turner to move the filled galette to the cookie sheet, fairly successfully. It looked a little worse for wear, but it still tasted great! we have made this twice in a matter of weeks and loved it every time. the pie dough is now my go-to for galettes (used last night in a salt and vinegar potato one). even my mother (the pie queen!) approves. thank you so much! TMGB — That salt and vinegar potato one sounds wonderful! Do you have the recipe or was it just ad-lib? I made this last night, and liked it a lot. I used refrigerated pie dough, though. I’m not into making pie crusts. One thing I would do differently next time is to not use two different types of tomatoes. I used red grape tomatoes and orange cherry tomatoes, and the red tomatoes burst long before the orange ones did. The red ones were SO burst that I stopped the cooking before the orange ones burst, then I had unbursted orange tomatoes in the galette and didn’t enjoy those. But overall, I liked the recipe a lot, and will make it again. Thanks! Holy moly this was good. Mine came out more liquid-y than in your pictures, but still tasted amazing. This was the perfect recipe to show off my farmers market haul. My local DC market was full of cherry tomatoes, corn, and summer squash this morning. I’m still a novice when it comes to pie crusts, but I had no trouble rolling out this dough. Yum! Oh wow!! I am surprised that I hadn’t seen this recipe here before, but I was scouting around the summer tab, and discovered this beauty! Deb, this is truly a winner!! Delicious as is!! Just made this for the first time! I used my food processor to cut in the butter — a technique I recommend if you happen to have a food processor. My grape tomatoes turned into more of a sauce, and I was worried it was too liquidy, so I let it cook off the liquid for about ten minutes (stirring every minute or two). It turned out well — not drippy or soggy in the galette. Rolled out, assembled, and baked it on a silicone baking mat, which worked well. Very tasty and summery! I now cook this regularly as a pasta dish from the outset (largely because I’m too lazy to make the dough). I boil 1lb pasta (casarecce is my favorite) while making the filling, then add the hot filling + 4oz goat cheese to the pasta, plus lots of pasta water for sauc-i-fi-cation. The tomatoes break down completely and it’s so perfect and delicious. Re-heats well too. Made this last night and it looked beautiful! However, when I tasted it it didn’t have much flavor? Did I miss a step in the filling? Made this on the weekend exactly as written–it is fantastic! I had about 3/4 cup filling left over which was perfect as quick sauté with spinach and scrambled eggs for breakfast. I will definitely make this again soon! Ayssa, Mine was very flavorful–did you use the red pepper flakes and salt and pepper? To me, that was enough. My tomatoes were perfectly vine ripe so I suppose that helped. I also drained the veggies and cooled completely before assembling. I meant to add fresh basil but forgot. I re-heated leftover in 350 oven next day for about 30 minutes and it tasted just like fresh baked and not soggy at all. Made this last night, with heirloom tomato slices, corn and shallots. The crust was perfect, I applied a little basil pesto before adding the tomatoes, didn’t cook the tomatoes, but I did lay the sliced tomatoes on paper towels to absorb excess juices. Recipe is a keeper for me! Thank you!! Priya — Blueberries, even those that are sweet when fresh, tend to taste tart in baked goods. For some people, that’s the appeal. If you’re not pouring a sweet syrup over your pancakes for contrast but would like a sweeter pancake, you can add more sugar to the batter. Also, I rolled the dough between 2 sheets of parchment paper and used the lower one to bake the galette on. The finished product slid right off and no transferring the sticky dough at any stage. That’s what I did, too. It was the only way I could imagine getting my sticky dough into the oven. No matter – it still tasted fabulous. Just made this tonight and it was a huge hit! I added some very small mushrooms at the zucchini step (they were the same size, roughly). I also included one shredded chicken breast (it was marinated in pesto for about a day, and left over) at assembly. The only other thing I would have changed is to add some whole garlic gloves in the saute pan that I would remove once everything was assembled in dough. Hi Deb, made this and it was delish– one problem I have with galettes, whether peach or tomato, is that the bottom is gooey while the top is beautifully golden and crisp. How can I prevent this?? Thanks! Hi Deb, this galette went down very well at a picnic over the weekend, so thank you for a great recipe. I can’t help tinkering though and I substituted half of the flour with whole wheat flour and included fresh marjoram in the filling. I am now dreaming up all sorts of alternative fillings to be encased in that lovely pastry! I made both the dough and filling the day before, stored them in the fridge and baked it in the morning – couldn’t have been easier. Deb, this dish was absolutely AMAZING! and so much fun to make, not to mention gorgeous. I brought it to our friends’ house last night and they raved about it. My husband who thought “tomato tart” didn’t sound good/interesting loved it and asked when I’ll be making it again. Total hit. I baked mine off on a PREHEATED PIZZA STONE and the bottom was beautifully golden and crisp. I made two pie crusts as I knew i would be making a second galette very soon. Your cookbook is one of my favorites out of the hundreds I have. Thanks, Deb, for NEVER disappointing. Made this last night, it was amaaaazing. The flaky crust, the crunchy melted parmesan, the beautiful zing of tomatoes… sigh, possibly my new favorite meal. I’d love to make this for friends who have an intolerance for lactose. How could I replace the yogurt in the dough…? This is one of my favorite recipes of yours, hands down! But I can’t help laughing; I’m considering making individually-portioned versions of this for a dinner party, and realized that the original recipe says it serves 4-6 as a main course and 8 as an appetizer. There are two of us and we can polish it off in one sitting if we’re both hungry! Maybe we’re just gluttons, but it’s so good that it’s hard not to eat it all at once! This recipe was incredible! Savory summer freshness. I cannot wait to make it again ASAP and maybe experiment with different veggies. The crust was perfect, golden, and flaky. And Deb’s method to saute the tomatoes like this made them more flavorful and made the juices soak into the zucchini and corn too. So, all the flavor, but without a wet tart/galette. I may even make a few for a dinner party! Any chance this could be made ahead of time (I.e. Early in the day, then reheated @ dinner time?) Or will it be too soggy to hold up that long? I saw Deb answer this when I was reading through the comments before. You can make the crust and the filling before, but I wait until before you are ready to bake before assembling. I agree – I think it will get soggy if it’s assembled beforehand and baked later. However, the leftovers were delicious when warmed in the oven! My guests and I liked this very much! It’s a good use for summer produce. When it was time to adjust the vegetable seasoning, I overestimated how much salt flavor the Parmesan would add, so my only advice would be to taste the filling again after you add the cheese to make sure you have salted to taste. Just make this without corn just because we didn’t have any, amazing! Ridiculously delicious!!!! I love this recipe. Fresh tomatoes and zucchini from our garden + local corn, yummy. I used a refrigerated pie crust as a quick start and I’m not disappointed. Great for hot summer nights when you want something savory but light. This has been one of my favorite summer meals for a few years now. 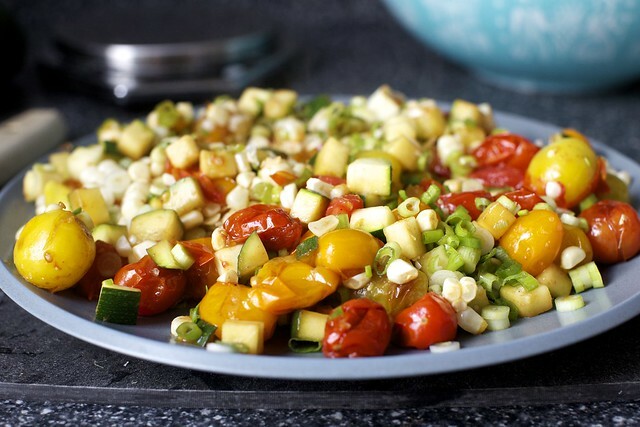 I only make it when tomatoes, corn & zucchini are perfectly in season….which makes this amazing. I change just a few things – sprinkle the crust with parmesan cheese (I think this might help the crust not have a soggy bottom) and add ~1 cup cubed mozzarella. So good. My kids fight over pieces. I made this tonight and it was SO. SO. GOOD! I modified the recipe by essentially combining it with your recipe for zucchini and ricotta galette, because that ricotta sounded too good to pass up. Mixed ricotta and parm as per that recipe (didn’t add the mozz since I didn’t have any at home), and cut back on the rest of the parm in this recipe to sprinkling on top of the filling and the crust. It was seriously delightful– what a perfect use of summer produce and got rave reviews! One question: does the galette dough freeze well? (I was thinking it would be nice to double or triple and then save a few dough-balls for later.) If so, would you recommend letting the dough rest in the fridge at all first before going to freezer? As always, thanks for the fabulous recipes and cooking tips! Glad it was a hit. The dough freezes excellently. This was a huge success! I’m cooking for one, so I halved the recipe with no problem and subbed feta for parmesan. A++! What if you put cheese between the tomato filling and the tart crust? Wouldn’t that keep it “dry”? It might help a little. This was so delicious! Fairly easy to make too. The filling is so good that I’m thinking of other ways to use it! Think this is my favourite recipe of the summer. Yes, it IS still summer in Montreal, although the mornings are cool. There are still loads of cherry tomatoes ripening in my garden, so I will definitely be making this again. My family loved it last night and I am so enjoying the leftovers for lunch today, reheated in a hot oven. My dough was scarily soft after an hour in the fridge, but I did my best. It could have been more attractive, but no one seemed to mind. I was careful to drain the juices after cooking the filling – they were too good not to drink! Awesome recipie. Is it heretical to suggest that a food processor makes any crust better and faster than most of us. Just pulse the flour with the butter a few times, then toss in the liquids, pulse a few times, and you’re done. That’s what I do -perfection every time! I make this probably 10 times a year. It is seriously THEEEE BEST. I could probably eat it 10 times a week. Just thought you should know. I made this last night and it turned out so pretty and the crust is amazing!! I had never made a galette before. It wasn’t difficult and it was so delicious. I immediately started daydreaming about other galettes I could make. (The husband votes for sausage to get involved.) I loved this recipe! Made this as written except for one addition: I brushed egg white over center of crust before adding the tomatoes, etc. It sealed the crust so didn’t get soggy. Otherwise, DELICIOUS galette, best ever!! In fact, FANTASTIC!! THANKS!! My husband hates zucchini so I took it out and subbed in peaches instead! It added a hit of sweetness that went so well with the rest of the galette. Would freezing this ruin it? The tomatoes might be a little soggy after but it should otherwise hold up fine. The veggies are all in our garden just waiting to be picked, and we have sweet corn in the refrigerator. I know what we will be making for dinner this week! Looks delicious! usually zucchini doesn’t cook well in tomatoes. do they actually soften in this recipe? Yes — it’s also sauteed first. Has anyone done this with pizza dough rather than the galette dough? I made this as written, except that I added a bit of fresh basil to the filling when I stirred in the scallions. The filling was very good, and would probably be even better with a little garlic. The crust was ornery. Even after sitting in the fridge overnight, it could not survive the counter-to-baking sheet transfer. I rerolled it right on the parchment paper into something oblong-ish and stuck it in the freezer for ten minutes before filling. The end result was very tasty, but I think I will try again using pizza dough–making either a galette or two or three calzones. I am making this for Sunday family dinner, looking forward to making my first tomatoe tart. It looks amazing! Well, as per usual, this recipe is lovely. I added a can of white beans because I am pregnant and hungry and my husband is just always hungry. I worried it would be too big for the dough. But it all fit! And it was delicious. Obviously. I made this for our dinner tonight. The dough is perfect for rolling and folding. I rolled it between parchment sheets. I was able to use our own Juliette tomatoes, summer Butter squash, and a small mild red onion instead of the scallions. I used two small cobs of the first of our corn. This galette was perfect to show off our summer produce and it was not difficult to put together-perfect for a hot night, with storms in the distance. What a pleasure! Thank you for deliciousness! Thank you! Thank you! Thank you for this perfect recipe! I just made this for friends and it was my first time making crust by myself. Everyone raved about it and couldn’t get enough of it. I have my second one in the oven right now. Only 2 days later because my husband loved it that much! This was the perfect use of my bumper crop of sun gold tomatoes! I added a teensy bit of lemon zest to the filling and it was perfect. A wonderful recipe which I continue to make over over again. I added some basil and thyme to the mixture. In addition, one little hint to avoid liquid. I made the filling the day prior to using. I set it in a strainer over a bowl and throw off the liquid from time to time (there is lots). This keeps all liquid out of the galette when you’re ready to assemble. Lots of options in the way of filling but I love this one. Still able to get fresh corn in Arizona in February. Thank you Deb. Overall, super easy and yummy. The filling is great and yes, it could be used in so many ways other than in a galette. I used whole spelt flour in the crust to see how it would go and although it held up just fine, it was not as flaky and crispy as when it’s made with wheat flour. Bummer! I’ll try using a combinaison next time and see if I can achieve the same delicious flakiness as a 100% wheat crust. I have to say tho, I made your zucchini and ricotta galette last week, and it is still our favourite. So good. It is a good recipe I will try myself for a healthy life. Perfect pastry crust, took no time to put together, delicious tart! Thank you Deb! Do you think you could make them this into mini galettes as you did with the Roasted Leek and White Bean? This isn’t the first time I’ve said this about one of your recipes, but this is truly one of the best things I’ve ever made! The crust was relatively easy to prepare, although I find using ricotta (as in the sweet galettes) over sour cream leads to a sturdier crust. I also sprinkled some parmesan below the vegetable filling, as another reviewer suggested. The remains of my farmer’s market haul lead to a filling that was closer to 1 cup cherry tomatoes, 1 large zucchini, and 3 ears of corn. It tasted like summertime. Overall, a fantastic recipe with lots of room for creativity! Thanks, Deb! To avoid the tomato-sogged crust, I subbed in sundried for fresh, layering them directly on the bottom crust where they happily reconstituted on zucchini moisture. It worked great! Lots of tomato flavor without the tomato mess. Just made this exactly like the recipe. Flavors are bold and good. Process for the filling is very good and wise. Love how you emphasized getting and keeping the moisture out so the crust wouldn’t get soggy. However, I thought the crust was very heavy. Tasty but too firm and a bit tough. And way too think. I rolled it out to about 14 inches to get rid of the thickness. I would have been happier with my old Betty Crocker flour and Crisco pie crust. Also, the filling is all over the place. It’s disappointing not to have in innards stay with the crust. The corn is flying all over. Not sure how to accomplish that. Flavors are great. Doubt that I’ll make it again. Made this last night. It was delicious and the dough was beautifully flaky… except very sour. I didn’t believe that this could be Deb’s fault, so I double checked and, yes, I added two TABLESPOONS of lemon juice instead of two teaspoons. (So that’s why I had to add more flour…) D’oh. Looking forward to making this again, next time with the right amount of lemon. This looked so inviting that I overcame my fear of making gluten-free pie crust – and it was so worth it! Filling is so flavorful, Romano provides just the right sharpness. Will be making this again before my cherry tomatoes quit producing; maybe next time someone else will get a slice. For the crust I used America’s Test Kitchen gluten-free recipe (with a brown rice flour blend) which contains some sour cream and some rice vinegar. It’s sturdy, buttery and flaky and has entirely changed my mind about g-f pie crust! Thanks for this beautiful summer dish! I made this galette last night & my husband could not stop raving about it. I had to make a few substitutions, because I didn’t want to go to the store. I used sliced green beans in place of the zucchini & frozen corn replaced the fresh. I had to use Asiago for the cheese & I added fresh garlic & fresh basil. I felt mine could have used a little more salt, probably because I didn’t have the parmesan called for, but it was still delicious! The pastry rolled out like a dream & I usually have a fight with it. I made this with a mix of grape and heirloom tomatoes and substituted bellavita for Parmesan. It was wonderful. The crust recipe worked really well. Made this for lunch today, a surprising cool rainy Sunday in September. It was a great success. Might add a little mozzarella cheese next time, too. This is absolutely delicious, the pastry was delightfully cooperative, the filling was quick to make, and my whole house smells amazing now. I will definitely make this again! I made this and it was delicious!! I did make some modifications to the filling. Sautéed a couple of garlic cloves and some shallots for a few minutes before adding the tomatoes, and added crushed red pepper, black pepper, dried basil, and dried oregano. Great success, and I’ve added it to my “go-to” fancy recipes! The flavours and aromas are gorgeous! Thank-you for surviving those spectacular fails, persevering and providing this delicious recipe. You’re the best.